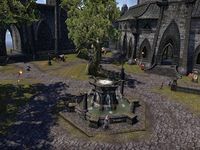 The Plaza Brindisi Dorom occupies the southernmost quadrant of Mournhold. It is a public garden dominated by a great statue at its center. The plaza is named after Indoril Brindisi Dorom, the duke of Mournhold who was killed when Mehrunes Dagon destroyed the city in 1E 2920. The southwest gate leads to Godsreach, the southeast gate to the Great Bazaar, and the Gates of Symmachus to the outside world. In 2E 582, both the Fighters Guild and the Mages Guild had their guildhalls on the Plaza. 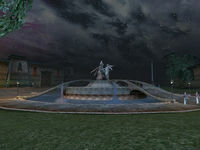 After the events that occur during the Fabricant assault on the Plaza, the statue of Almalexia and Mehrunes Dagon in the center of the square is torn asunder, revealing an entrance to the Dwemer Ruins of Bamz-Amschend. For game-specific information, see the Tribunal Plaza Brindisi Dorom article. This page was last modified on 15 December 2014, at 20:12.